CHECK OUT THE NEWEST BLOG ENTRY IN OUR HERBALIST'S JOURNAL BLOG! your on-line source of information about all things herbal, seasonal celebrations, following the cycle of the year, using herbs in all aspects of your daily life~ from mundane to medicinal, foods to frivolity, serendipity to spiritual and from entertainment to esoteric. If you are an herb gardner, crafter, love herbal lore and myths, want to know how to use herbs for your pets, understand common foods as medicines (is saurkraut a healing herb? ), put on a tea party, garden with the faeries, want to use your backyard plants as a medicine chest for your family, make simple herbal preparations, learn to appreciate "weeds", learn how the seasons affect our health, use plants to aid in relaxing and enjoying your life...you have found a home. With the school year getting ready to start, learn how herbs can help your family deal with all the common seasonal illnesses. Wholistic Healing for the Family, our e-book, offers an easy to use format that will give a quick reference to common family complaints. Do you want to learn about herbs in-depth? Choose from a variety of on-line Classes and Apprenticeships. Or, do you simply want to enrich your knowledge of using herbs and plants in a less formal way? Choose a mini-workshop covering a variety of topics, such as herbal aphrodisiacs, making tonics, beauty aids from the garden, herb theme parties, heirloom gardening, Celtic herbalism, children's gardening, edible flowers, Biodynamic gardening, Flower Essences.....Then take your time to explore, sip a cup a tea & begin to take your place in the cycle of the year... Learn...Enjoy.....Celebrate!! Using herbs in daily life can be messy, time consuming and a source of mockery from family and friends. So, why bother ~ or at least, why bother doing it yourself, when you can buy so many ready made herbal products? Humans, animals and plants evolved together, so we have an intense affinity for them. In the case of plants, we use them everyday to signify celebrations and life cycle events and we depend upon them for nutrition. But, they also bring us joy and comfort, excite our senses and they are often shrouded in mystique with associated lore and rituals. But, there is a very practical side to herb use as well. In taking more responsibility for our own wellbeing, there is a constant question of quality and efficacy ~ is a particular remedy/medicine/therapy helpful to you or is it a cookie cutter/ one size fits all approach to healing? Each of us is very different and each illness is different in the way it reacts in your body ~ and seasons affect the reaction not only of your body to an illness, but also to the remedies. So, using herbs appropriately either alone or in conjunction with standard medical treatment allows each of us to evaluate our conditions and tailor make remedies suited to a particular set of circumstances. Growing and processing your own herbs also allows for quality control ~ making sure you are not only getting what you need, but that it is free of contaminants and is fresh/vital. There is also something to be said for the healing power of being involved in your own self care. To grow, nurture, harvest and prepare herbs for use, connects you to your own needs in a very significant way, slows you down enough to really take a look at the how and why of illnesses and not only how to recover, but to avoid repeated occurances and to end up healthier in the long run, not just "better" after each health episode. My guess is that if you are on this site, you have already discovered and suspect there is more to healing/wellbeing than just taking pills and vitamins, that we are unique in our needs and have found standard care often lacking. That is not to say that modern medical treatments do not serve us well in many instances, but herbs can be a valuable addition to the most severe therapies, helping them to work better and aid us in remaining strong and building health as you go. HOW DO I GET STARTED WITH HERBS? Unfortunately, herbs have a somewhat exotic reputation that makes it a bit daunting for many to just jump in and begin using them. Remember, until 100 years ago, herb and plant use was everything...medicines, fabric, food, building material, energy. What many do not realize, is that the plant kingdom is STILL the major supplier of all our daily needs in spite of our many modern achievements and discoveries. Herbs are common, approachable, easy and economical to use and by and large, safe. ~Begin with what you have on hand. Do not go out and buy anything new--yet. 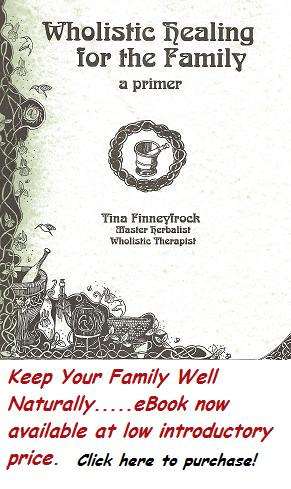 ~Take a look around your home and yard and see what herbal products or plants you already have at your disposal. This means re-evaluating your concept of what an herb is and expanding your definition ("Herb"-any plant that exists.--"Herbalist"-one who uses herbs for a particular purpose.) Loosely defined, you are likely already using herbs regularly. If you drink coffee every day, if you use a broom to sweep your house, send flowers on special occasions, use natural perfumes, wear cotton clothing, live in a wooden home, grow a garden, or obviously, eat food; you are purposefully using plants in your everyday life. Simply recognizing this amazing fact allows you to feel less daunted about jumping in with more specific herb uses. ~Start by adding little amounts of fresh or dried herbs to EVERYTHING you eat-soups, breads, salads, in smoothies, on sauteed/baked/steamed or grilled foods. Choose flavors you really like such as using up all the culinary spices you have in your cabinet. Amount is less important than regular use in term of building health. And...using small amounts does not overwhelm unwilling or skeptical family members. ~Make an herbal vinegar or butter--two of the easiest herbal preparations. To taste, simply add chopped herbs to cider vinegar, let sit and thn use it as a base for dressings. You canadd herbs to butter and use fresh or roll butter in wax paper and freeze - then cut off "pats" as needed. ~Sprinkle mint in your pet's beds. It makes them smell good to you and not so good to fleas/ticks. ~Drink a different tea every afternoon to explore what you like and to begin slowing down your life a bit. Everybody likes mint or chamomile, so start there and then try lemon balm, pineapple sage, raspberry leaf...These are safe for all members of the family and the possibilities are endless. ~Press flowers and leaves for cards or bookmarks to give away as gifts. This is a fun way to get kids interested too. ~Let a 3x3 area of grass in your yard go unmown for the summer. Unless you have used herbicides or have new turf, you will undoubtedly see many of the plants in your field guide growing right in the yard. These will include beautiful wildflowers and useful edible and medicinal plants that most people pay good money to plant or buy as a remedy. ~Learn the uses of Dandelions!!! EVERYBODY has them and spend lots of time trying to get rid of them. But if you really look at them, they are a perfectly nice flowers, kids love to play with the seed puffs, they make great fritters, salad greens, wine, herbal tonics for kidneys/blood and liver. They are packed with vitamins/minerals. I use them finely chopped on pizza in place of oregano. No one has ever noticed the difference. ~Wind down the day with an herbal cordial. ~Steep relaxing herbs (lavender, lemon balm, chamomile, etc.) in your favorite wine or brandy. It adds nutrients and acts as a fine nervine for stress related problems and digestive issues. For kids, do the same in their juice or warm milk. ~Find out what herbs are associated with your birth sign. ~Take it slow, relax and enjoy. Before long, everything herbal will infuse your life! Buying store bought herbal preparations is often fine, if research is done into good products, but there are many that are lacking in quality. Sometimes the freshness of the herb makes all the difference in how well it works (many studies that try to dispel the usefulness of herbs use old/powdered products and very unreasonable dosages). If we want to feel vital, how can that be accomplished with lackluster herbs and foods? This is even more important if an illnes is already ongoing. Herbs then, can serve as the only treatment we may need at any given time, or as an adjunct to more traditional care. In either case, herbs add a sense of emotional wellbeing and offer our bodies a type of remedial care that is encoded in our DNA and allows us to feel connected to the process of healing. Then there is also the concept of "healing" encompassing everything we do in life, how we live each day and what we choose to surround ourselves with. Herbs have a place in our housekeeping and beauty routines, in the ways we can celebrate and play..and in turn, we can help heal not only ourselves, but those around us and the environment. AND... did I mention that herbs can be lots of fun? ~While there is no substitution for learning about herbs in the company of an herbalist and exploring where they are growing, it is becoming obvious that more people seek this sort of information, but do not live close enough or do not have the time or funds to take classes. It is hoped that anyone who has an interest ~passing or in depth~ will find a class here that is enriching and fun; but that can be a true learning experience with regular contact from a practicing herbalist, to help guide you through questions and inspire you to explore further. There are a multitude of herb sites that can offer good, in depth, descriptions of plants, so I will not duplicate that - though links will be provided to those sites. Nor will you find any suggestions of excessive restrictions on foods or that there are herbs that will cure everything or make you lose weight without really trying. Here, the information provided is meant to make herbalism more accessible and easy to integrate into your daily life and to give you the tools you need to participate in the cycle of nature. ~The approach to herbs and herbal healing found here will be a blend of science and traditional lore ~with an emphasis on exploring the natural world at large and developing a trust of your own inner resources. Traditional healing respects individual needs, teaches nurturance, acceptance, responsibility, intuition, ritual and a recognition of seasonal changes. Honoring the needs of the life cycle, from birth to death, we can live in harmony with ourselves and our environment. it's upkeep with a donation. Thank you!